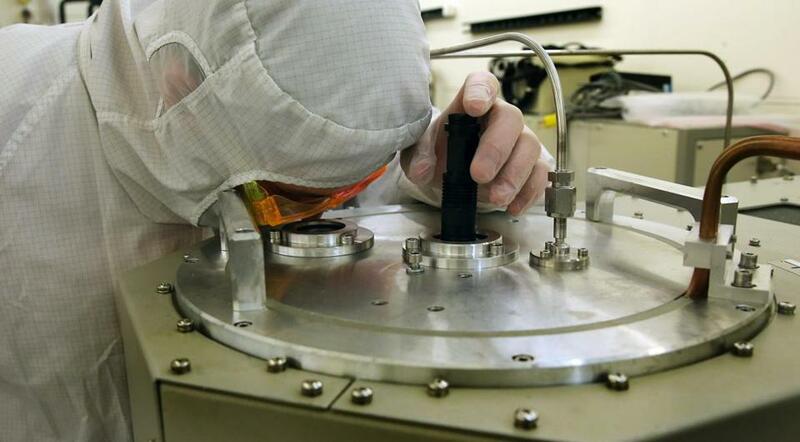 Louis Perna, a cofounder of Accion Systems, observed a wafer being etched at MIT. Earth-orbiting satellites traditionally weighed as much as trucks, but in recent years space has been filling up with satellites smaller than a minifridge for educational, research, and defense uses. Unlike larger satellites, which can carry a heavy cache of fuel, these small satellites are often launched without their own propulsion systems, making them hard to control and too often shortening their useful life in space. Now, a startup in Somerville, Accion Systems, is developing a series of tiny thrusters, slightly larger than a pack of gum, that will allow these satellites to maneuver and adjust their orbits, even fly in formation or decommission themselves by spiraling down to burn up in the Earth’s atmosphere. Accion’s prototype is a compact metal case that houses electronics and tiny tanks of propellant, with thrusters about the size of coins mounted to the top. 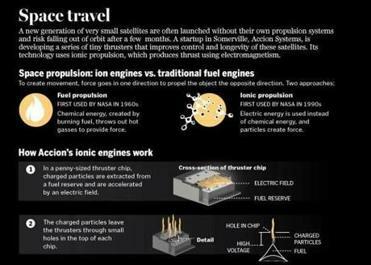 Unlike a chemical propulsion system, which produces thrust by burning fuel, Accion’s device uses ion propulsion, which harnesses electromagnetism to shoot charged particles behind it, producing thrust. NASA used an ion-propulsion system in its 1998 Deep Space 1 probe. A new generation of very small satellites are often launched without their own propulsion systems and risk falling out of orbit after a few months. Ion propulsion, Brikner said, has advantages for long space missions. It’s more efficient than chemical propulsion, so less propellant gives a spacecraft more hours of thrust. It’s not combustible, crucial for small satellites launched on rockets that don’t allow flammable payloads because of the danger they could pose to the rest of the cargo. As a result, many small satellites are deployed with no thrusters at all and often fall out of orbit after a few months. “On a spacecraft, mass, volume, and power are your most precious resources,” Brikner said. Brikner’s work dates to her time earning a PhD at MIT’s Aeronautics and Astronautics department. Most ion thrusters use xenon gas for propellant, including the NASA Deep Space craft. But instead of using gas, Brikner and her MIT adviser, Paulo Lozano, explored using an ionic liquid, which at base is salt in a liquid form. “It’s cheap, safe to handle, and easy to test with,” Brikner said. Accion Systems cofounder Natalya Brikner said ion propulsion is more efficient than its chemical counterpart. Initial tests were promising, so Brikner and her classmates started developing an entire propulsion system based on the concept. They were surprised, she said, when large aerospace corporations started asking whether the technology was for sale. Brikner’s first attempt at starting a company, in 2010, was a satellite launch venture that didn’t get off the ground. But Lozano suggested that the new ion-propulsion technology might be an opportunity to try again. 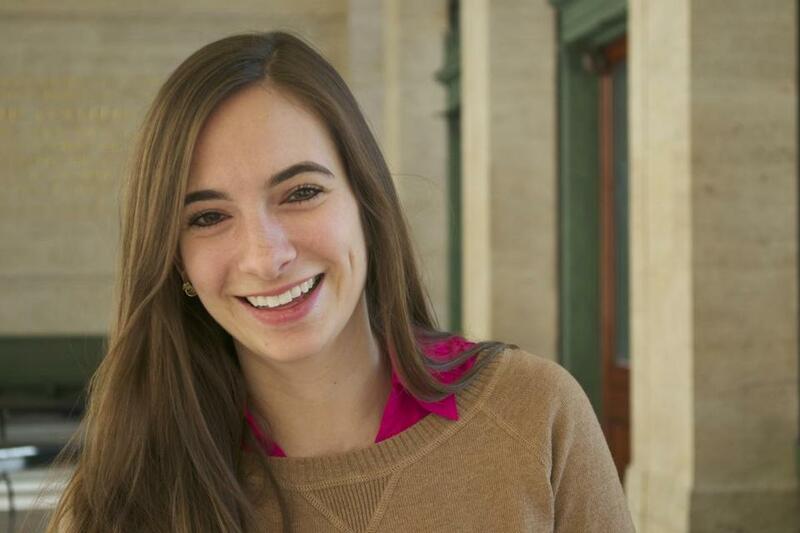 Brikner and MIT classmate Louis Perna founded Accion last year, with Lozano on board as a technical adviser. Also on Accion’s advisory board is former Raytheon Co. chief executive William Swanson, who met Brikner at an MIT accelerator program last year and has been her mentor at Accion. Earlier this year Accion raised $2 million from FF Science, RRE Ventures, and others. In February, it tested its first prototype under laboratory conditions. For now, Accion is building propulsion systems for four partners. Brikner said she can’t disclose their names, but several are defense contractors, and one is likely to launch a satellite with Accion’s device this fall. Accion is also negotiating with Aurora Flight Sciences, an aerospace company in Virginia, about using its thrusters to synchronize small satellites into rigid formations, which could help improve coverage for data and communications networks. Carolyn Belle, an analyst for Northern Sky Research, said the aerospace market is ripe for a thruster that improves the control and longevity of small satellites. If she succeeds with small satellites, Brikner said next would be to adapt the technology to larger craft. Jon Christian can be reached at jonathan.a.christian@gmail.com. Follow him on Twitter at @jon_christian.